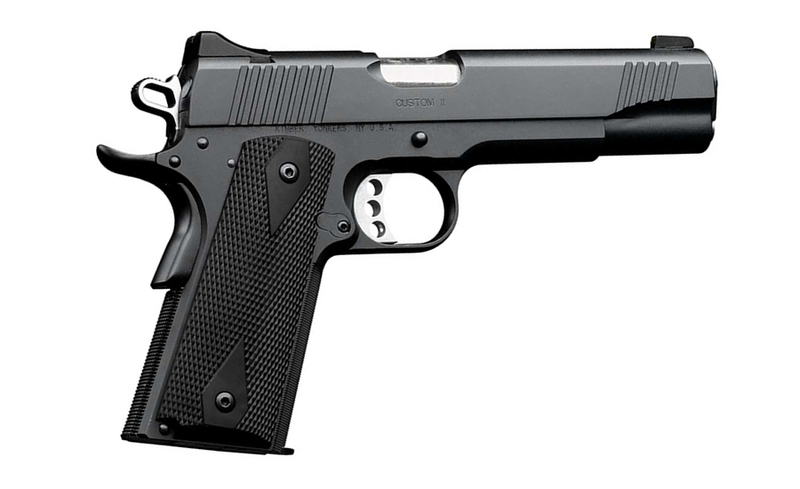 The Custom is now the Custom II, because like most Kimber 1911s it incorporates the Kimber Firing Pin Safety that makes each pistol more secure without impeding performance or altering trigger pull. It has also become a family, with twenty one models in five calibers. LAPD, SWAT Team carries them. So do United States Marines, thousands of law enforcement officers and hundreds of thousands of American shooters who refuse to compromise with either a lesser pistol design or another brand. Kimber Customs are made the right way and from start to finish in the Kimber factory here in America. There is no other way to ensure such a high level of quality. As with all Kimber pistols, standard features set Customs apart from other brands. Barrels, barrel bushings, chambers and triggers are all machined to match grade dimensions. Ejection ports are lowered and flared. Sights are mounted in dovetails machined into the slide. Thumb safeties are extended. Highride beavertail grip safeties also have a memory bump. Match grade frame, slide, barrel, bushing and chamber. Custom features standard; extended thumb safety, high ride beavertail grip safety, beveled magazine well and slightly extended magazine release and slide release. Match grade barrel is machined from a single piece of solid steel for accuracy and long life. Enlarged firing pin stop locks the extractor in position for absolute reliability. Beveled magazine well on all pistols ensures quick magazine loading. All Kimber pistols feature a polished breech face for flawless feeding and extraction. Try this firearm out at our shooting range with one loaded magazine (ammo included) for $9.99 before buying. If you then decide to buy the same model brand new at our firearms counter, instantly receive $9.99 off the purchase price! See our Obetz store for more details.